In the picture you can't really see the orange peel but the texture is still there. 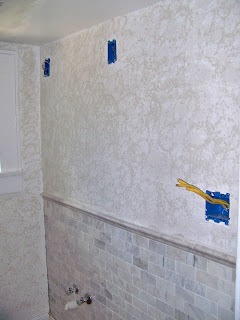 It felt like we had made so much progress once this was done since it visually tied the walls together. I also spent awhile grouting the tile since they were now dry. Since I decided to use a gray grout, I sealed the marble so that the grout wouldn't stain the marble. Using a grout float, I pushed the grout in between the tiles. 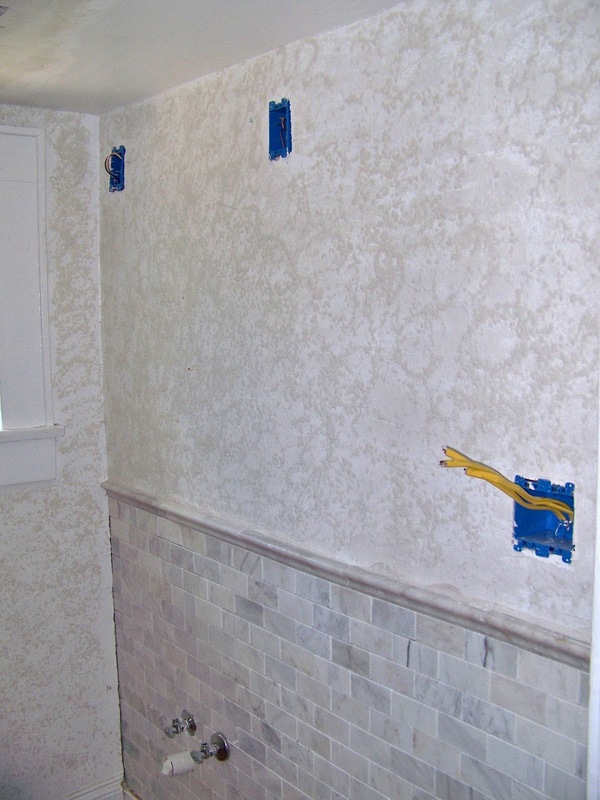 This is easiest if you move in lines diagonal to the actual grout lines (you get more coverage). Then, using a large sponge, I gently washed off the excess grout making sure to saturate the grout lines with water (that will make them crack). Once the grout was dry the next day I gave the half wall of tile a nice washing and made sure that the grout film was washed off. The last step this day was to install the light fixtures. This is pretty simple and since the power was already off it was easy to just attach the wires (black goes to black, white goes to white, ground goes to ground and gets attached to the grounding screw) and pop these guys on the wall. In these pics the grout is still drying and so the tiles look darker than they do now. They still look a smidge darker then when I first put them up but it makes it look like they've been there forever which I really like. I should also mention that I also gave the floor a really good cleaning and used Orange Glo's refinisher to give a little shine to the floor. Since it is original we didn't want to do anything major to it. The floor was the last step before the toilet and sink could get installed so next up you'll get to see how this bathroom looks with actual bathroom things in it!